Ayurveda recommends several health practices that clean and nourish the physical body in order to maintain balance. Abhyanga, also called oiling, is self-massage with an oil chosen to support balance for an individual's constitution. The practice of abhyanga is an anointing with oil; it's a sacred practice that's more like meditation than simply moisturizing your skin. In fact, the Sanskrit word for oil, sneha, is also the word for love. Oil massage is a practice of taking time to show your body love, appreciation and kindness. Many benefits are given for the practice, including improved blood flow, reduced pain and inflammation, reduced stress and anxiety and feelings of having more energy or vitality. The process is simple, and takes ten to fifteen minutes for a full massage. Using oil warmed for a moment in your hand, you begin at the crown of the head and work your way down to your feet. I recommend a weekly full-body massage, and perhaps a daily massage if you have "trouble areas," places that tend to hold tension or pain. Different oils are recommended for each constitution, and for each vikruti (the way in which you may be out of balance). The following oils are fairly easy to find in most supermarkets and may already be in your pantry. Look for organic, unrefined options if possible. Sesame oil is preferred for vata constitution, as it has a warming quality that is very soothing and a light nutty scent that stabilizes the movement-oriented temperament of vata. Choose untoasted sesame oil, organic if possible. Sesame oil is also preferred for kapha, for the same warming quality. However, it is recommended to use less oil for kapha, and to precede oiling with dry-brushing or gently rubbing skin with a washcloth to perk up slow-moving kapha. For pitta, sunflower or coconut oil have a softening, cooling affect that can temper the fiery nature of pitta. For pitta types especially, it's important to take time to enjoy the process of abhyanga, and using oils naturally scented with herbs or essential oils can be helpful. Plan to use an older towel that you don't mind getting oil on. Oils can stain fabric, and over time, the oil residue in the fabric will likely become rancid and you may need to discard the towel or reduce it to "rag" status. Also, if you shower or take a bath after applying the oils, your tub will be slippery. Be safe. Have something to hold on to if falling is a concern, and clean your tub shortly after your massage so you or other family members don't slip. Before you begin oiling, choose a day and time of day when you will not feel rushed or be interrupted. Abhyanga is traditionally practiced as part of a morning routine, but many people enjoy it as an evening ritual to prepare for sleep. Choose a time that fits your personal schedule best. And make sure your space is clean and uncluttered, perhaps with music, candles or pleasant scents if that helps you feel relaxed. 1. Pour a small amount of oil in your palm and allow it to warm. As it warms, you might focus on your breath or say a mantra or short word of gratitude. 2. Begin with the scalp. * Apply the oil to the crown of your head and use gentle circular motions to move the oil across your entire scalp. Then apply the oil to your temples, outer ears, and the base of your skull, working across and down the neck. 3. Apply a small amount of oil to your face, avoiding your eyes. Work in upward, outward moving circles across your forehead, cheeks, jaw, nose and chin. 4. Work the oil across your shoulders and chest in the same broad circles, then down your arms, to your wrists, hands and fingers, moving in long strokes down the arms and circular motions around each joint. Then work back up again the shoulders and chest. 5. Apply the oil to your abdomen and back, using large, gentle circular motions. 6. Then work down your hips and buttocks and down each leg all the way to your toes, the same way you did your arms, and work back up again to your hips. 7. At this point, you might like to sit on your towel and apply oil to the soles of your feet. 8. Take a warm bath or shower. Avoid using soap if possible, so your skin has more time to absorb the oil. Use a towel to dry off and remove excess oil. For your hair, you can choose to shampoo immediately after your oil treatment, or leave the oils on your scalp overnight (cover your pillow with an old towel if you do) and wash in the morning. * If oiling your scalp is not for you, that's OK! The first several times I used oil, I skipped the scalp part, because I didn't want my hair to feel gross. Once I tried it, I loved how healthy my hair and scalp felt (after a thorough shampoo), and I look forward to my next "treatment." But it's not for everybody. The entire process takes me about fifteen minutes, and I like to soak in the tub for about fifteen minutes afterward as well. Oil massage has become part of a weekly ritual for Sunday evenings, and sends me into deeply restorative sleep that night (which helps get the week off to a smooth, easy start). May this be a fruitful practice for you as well! The primary goal of Ayurveda is to bring us into balance, both with internal forces (like natural tendencies, habits and constitution) as well as with environmental qualities. As the seasons change, ayurveda recommends adjusting daily routines, foods, even your yoga and meditation practice, so that you can remain balanced in different circumstances. A steady routine is the most important practice to balancing vata, the quality of movement which, when provoked, causes symptoms of anxiety, sleep disturbance, tension and stress, digestive distress and other disruptions to our bodies' regular healthy function. Routine means waking up and going to bed about the same time each day, eating meals about the same time, and going about your work and activities in the same sort of pattern. It may sound boring, predictable, or even impossible, but our bodies work so much better when there is a dependable, reliable pattern. Because winter tends to be a time for moving slower, shorter days and less outdoor activity, it can be a good time of year to develop a sustainable routine. And mornings (before your day gets derailed) are often the best place to start incorporating a routine. Winter is a time of quiet, dark, wet, cold and sometimes wind, and ayurvedic recommendations for morning routines favor activities which are light, soft and warm, to help balance the seasonal changes. As you are putting a new routine in place, start small. Don't try to do all 9 of these things right away every morning just because it's "Best." Incorporate one or two that appeal to you, and when those become a habit that is working for you, add one or two more. Sustainable change happens at a slow, steady pace. 1. Wake up with the sun. It is generally recommended to wake up a little later in winter, since the sun rises later. For pitta and vata constitutions, waking between 6:00 and 7:00 am is recommended. For kapha, wake up at least an hour two before sunrise, 5:00-6:00 am, to get the body moving well before the heavy kapha energy that predominates from sunrise to mid-morning makes it difficult to get going. Before getting out of bed, take a moment to set the course of your day with a positive intention, prayer, mantra or a visualization. You may already have a practice you can incorporate. If not, try just taking a moment of gratitude for something that is working in your life or brings you joy. 4. Drink some warm water. A few sips of warm water, perhaps with a squeeze of fresh lemon juice, is the best way to wake up your internal system and "kindle" your digestive fires. Try sipping some warm water before racing to the coffee or tea, to see if it gives you the clarity you crave without the caffeine. Regular digestion is crucial to health, and ayurvedic texts recommend going to the toilet for a bowel movement at the same time each morning to establish or maintain regular elimination. Shower, or at least splash some clean water on your face, brush your teeth and floss, and brush your hair so you are ready for the day ahead. A gentle yoga practice or a morning walk is recommended. There's no need to sweat a great deal. Just get the major muscles and joints moving early in the morning so your body is recharged. Spend some time in quiet reflection, with a grounding, quieting practice of yoga breathing, meditation, prayer or something like journaling will give your day an intentional direction. Eat a nourishing, balanced meal to give you energy for your day. Plan your morning routine so that you have enough time to eat without hurry and you can enjoy your meal without distraction. In the winter, breakfast should be warm, and perhaps a little heavier than in the warm months. Oatmeal or other cooked grains are a good start, especially if you add warming spices like cinnamon, cardamom, nutmeg and clove. Try to avoid sugary cereals or baked items. Take a moment before eating to give thanks, to appreciate your meal and the opportunities the day before you brings. Directing your mind toward gratitude lifts the spirits and the rest of your day will be framed with this positive thinking. One of Ayurveda's strengths as a science for health is the recognition that we are influenced by our environment. Everything in nature is characterized by qualities--dry or wet, turbulent or stable, etc--and the changing of seasons presents a new environment that can affect the balance of our system. Winter arrives with short days, overcast skies, less light, and bitter cold. The air is either dry and windy, or heavy and damp. This is the season of kapha, the earth and water element, and vata, the air and space element. Kapha has the tendency to slow down and settle; it is what builds the substance of your body and gives a healthy glow to skin. Because of the strong presence of kapha in winter, this is considered the best time of year to build strength, immunity and health. It is the perfect time to rest--to get better, more satisfying sleep, and enjoy quiet reflection and meditation. It is the perfect time to nourish yourself with warm, healthful foods. And it's a wonderful time to enjoy creative pursuits and bond with family and friends. But if you happen to have a tendency to go out of balance toward kapha or vata, the gray skies and cold, windy days can increase those qualities and have a negative impact on your health. If you have mostly kapha in your constitution, the lower light levels, gray skies and cold, wet weather may leave you prone to congestion, weight gain, and depression or apathy. The best thing you can do for yourself in the winter is get lots of natural light. The more time you can spend outdoors in daylight or near sunny windows, the better. Kapha has a natural inclination to darkness, and can experience symptoms of depression, boredom and dissatisfaction when away from light for too long. The next best thing for kapha is movement. Kapha likes to be still and sedentary, and while some stillness is certainly appropriate in the colder months of the year, too much can lead to stagnation, weight gain and congestion. Kapha also loves to sleep, and should avoid getting too much sleep in winter, which tends to increase lethargy. Seven or eight hours of sleep are recommended, with waking before 7:00 am, to take advantage of as much daylight as possible. Food should be relatively light, preferably cooked with warm spices like cinnamon, ginger and pepper. Although gray days are less likely to be a hindrance, the wind, dry air and cold can increase vata and leave you feeling scattered, achy and prone to illness. Vata naturally tends toward movement, and sometimes that movement can turn to chaos. Keep yourself grounded by sticking to a regular, daily routine. Go to bed, wake up and eat your meals at regular times each day. And take advantage of this time for slowing down by not overbooking or overextending yourself. Oiling with a self-massage routine, or abhyanga, is one of the best ways to pacify the dry, light qualities of vata. Sesame oil is best. You'll want to warm it in your hands and gently massage into your skin. Eat warm, dense foods, with plenty of healthy fats. Naturally sweet foods, like fruits and grains, are also very nourishing for vata. Winter is often the easiest season for those who have predominately pitta characteristics, as the cold and damp give balance to their fiery, sharp nature. Although there are no particular challenges for pitta, sometimes those who have this quality need reminding that winter is an opportunity to slow down and enjoy. Once the weather turns, pitta can sleep a bit more, stay in and rest, and spend time with their loved ones. It's important for pitta to take some time to wind down in this slower part of the year, or their natural drive and enthusiasm gets worn out. Hopefully these tips will give you a good start to making the most of this time for rebuilding and renewal! If you've been interested in yoga very long, you may have heard of Ayurveda, the sister science of yoga that focuses on maintaining health and longevity. As a science, Ayurveda is based on thousands of years of observing patterns in nature and human behavior and their impact on health. It looks closely at the relationship between a person and his environment, and recognizes that although there are patterns, each patient is a complex individual and should be treated as such. Knowing how to be healthy begins with knowing what "balanced" means for you. To treat the individual, Ayurvedic practitioners begin by assessing a person's constitution to determine what lifestyle, diet and medication/supplement recommendations will best maintain health. The assessment process is based on a Tridosha (three element) system that observes the presence and activity of three qualities in a person's behavior, physical attributes, and symptoms. Each individual has a "constitution," or prakriti, an essential nature which is the particular balance of elements that maintains steady health for them. The three elemental qualities are Vata (air and space), Pitta (fire and water) and Kapha (earth and water). Each individual has a natural balance of these elements which is unique to them, and at which they enjoy good health and energy levels. Vata, the quality of air and space, is light, free and subtle. It influences movement, and is the element of clarity and creativity. 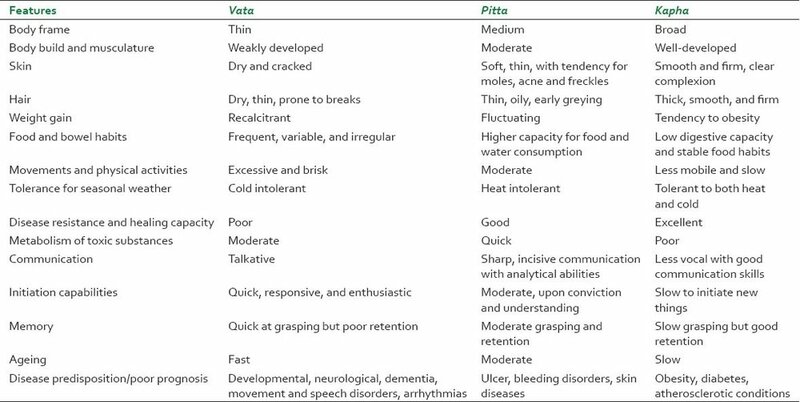 Pitta, the quality of fire and water, is hot, sharp and penetrating. It is the transforming force, and handles digestion (of food and information), metabolism and perception. Kapha, earth and water, is steady, calm and serene. It is the force of stability, structure and heaviness. Each element is present to some degree in everybody, and understanding your unique make-up of these elements, your prakriti, is the first step to finding the correct lifestyle, diet and medicine recommendations that will keep you in balanced health. You can find tests to determine your own prakriti online and in books on Ayurveda. The chart below gives a description of the characteristics each element has. Take a moment to look through the qualities given for each feature. You may find that you predominately match one element, or perhaps you are split between two or even all three. Accessed from: Subhojit Dey and Parika Pahwaj. "Prakriti and its associations with metabolism, chronic diseases, and genotypes: Possibilities of new born screening and a lifetime of personalized prevention." Journal of Ayurveda Integrative Medicine. 2014 Jan-Mar; 5(1): 15–24. An important thing to remember is that prakriti describes the balance of elements in which you are healthy. However, your environment, habits and proclivities can influence you in a different direction, taking you out of balance. The description of how you are out of balance is called vikruti. So, you might have a Pitta prakriti, with a Vata vikruti. The work of an Ayurvedic practitioner would be to suggest activities which reduce Vata symptoms, while keeping your natural Pitta state balanced. For example, travel tends to exacerbate Vata, and may bring about symptoms like anxiety, faster breath, and decreased immune response. So if you have an upcoming trip, an Ayurvedic practitioner would likely recommend drinking warm water, eating warm, heavier foods, and doing a grounding yoga and meditation practice to prevent Vata increase. Ayurveda is based on the very simple principle that like increases like, meaning that you can choose activities, habits, and foods that have qualities you would like to promote, and avoid things that have qualities you would like to reduce. Once you know what being balanced looks like for you, you will be able to take a personal approach to supporting your health with appropriate diet, exercise and lifestyle choices. Check back next week for a Guide to Winter Wellness, full of tips to balance your health and keep your immune system strong and energy level all season long. Ayurveda: A Complimentary or Alternative Medicine?